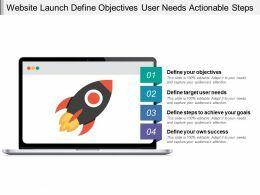 Presenting this set of slides with name - Website Launch Plan Design Develop Launch Optimize. This is a five stage process. 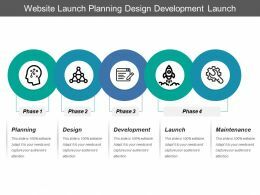 The stages in this process are Website Launch, Market A Website, Website Introduction. …powerpoint slide deck. 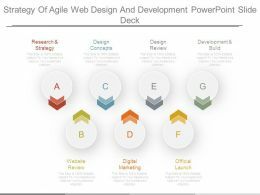 This is a strategy of agile web design and development powerpoint slide deck. This is seven stage process. 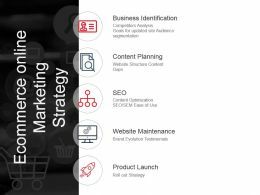 The stages in this process are research and strategy, design concepts, design review, development and build, website review, digital marketing, official launch. 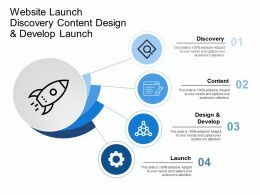 Presenting this set of slides with name - Website Launch Discovery Content Design And Develop Launch. This is a four stage process. 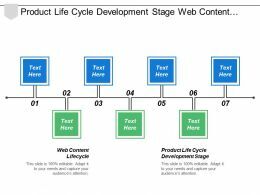 The stages in this process are Website Launch, Market A Website, Website Introduction. 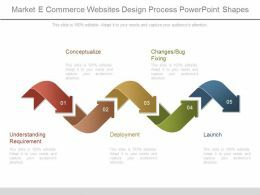 Presenting market e commerce websites design process powerpoint shapes. This is a market e commerce websites design process powerpoint shapes. This is a five stage process. The stages in this process are conceptualize, understanding requirement, changes bug fixing, deployment, launch. 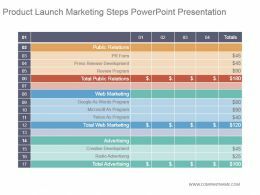 Presenting marketing launch plan powerpoint show. 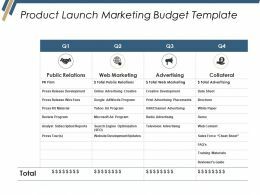 This is a marketing launch plan powerpoint show. This is a eight stage process. 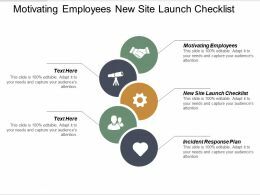 The stages in this process are create press release, update the website, use twitter, garner endorsements, use advertising, build demand, create email contests. 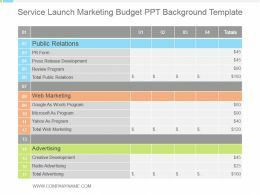 Presenting service launch marketing budget ppt background template. 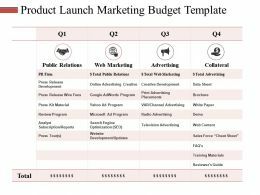 This is a service launch marketing budget ppt background template. This is a three stage process. The stages in this process are public relations, web marketing, advertising, creative development. 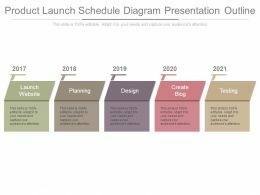 Presenting this set of slides with name - Website Launch Planning Design Development Launch Maintenance. This is a five stage process. 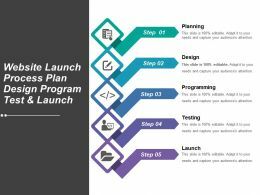 The stages in this process are Website Launch, Market A Website, Website Introduction. 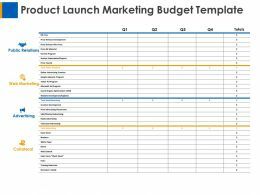 Presenting marketing launch plan ppt sample file. 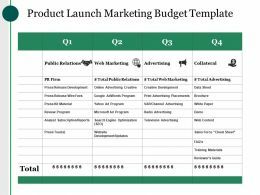 This is a marketing launch plan ppt sample file. This is a eight stage process. The stages in this process are create press release, update the website, use twitter, garner endorsements, use advertising. 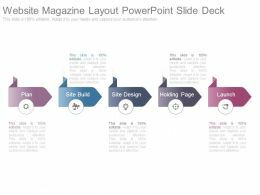 Presenting website magazine layout powerpoint slide deck. Presenting website magazine layout powerpoint slide deck. This is a website magazine layout powerpoint slide deck. This is a five stage process. 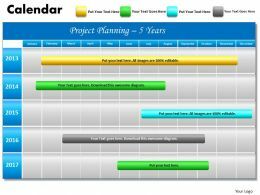 The stages in this process are plan, site build, site design, holding page, launch. 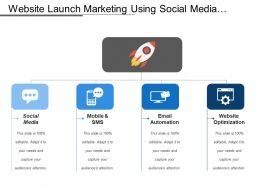 Presenting this set of slides with name - Website Launch Marketing Using Social Media Email Mobile And Sms. This is a four stage process. The stages in this process are Website Launch, Market A Website, Website Introduction. 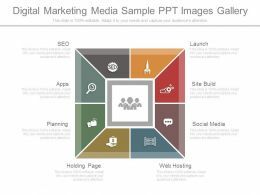 Presenting digital marketing media sample ppt images gallery. 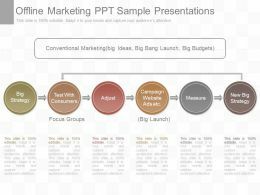 This is a digital marketing media sample ppt images gallery. This is a eight stage process. The stages in this process are launch, site build, social media, web hosting, holding page, planning, apps, seo. 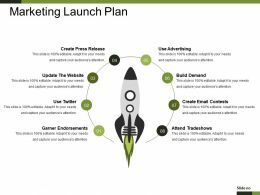 Presenting marketing launch plan ppt ideas. 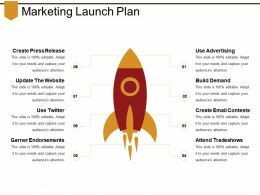 This is a marketing launch plan ppt ideas. This is a eight stage process. The stages in this process are create press release, update the website, use twitter, garner endorsements, use advertising. 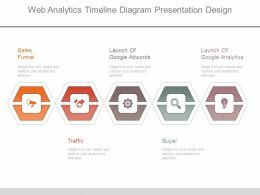 Presenting web analytics timeline diagram presentation design. 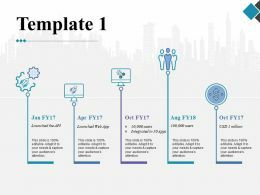 This is a web analytics timeline diagram presentation design. This is a five stage process. The stages in this process are sales funnel, launch of google ad words, launch of google analytics, buyer, traffic. 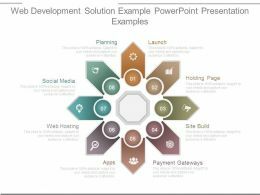 …web development solution example powerpoint presentation examples. 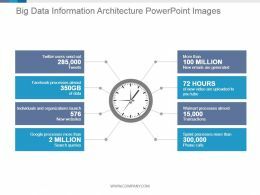 This is a web development solution example powerpoint presentation examples. This is a eight stage process. The stages in this process are launch, holding page, site build, payment gateways, apps, web hosting, social media, planning. 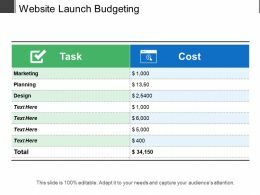 Presenting this set of slides with name - Website Launch Budgeting. This is a two stage process. 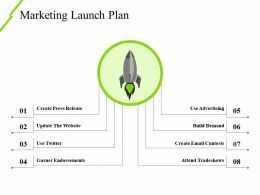 The stages in this process are Website Launch, Market A Website, Website Introduction. 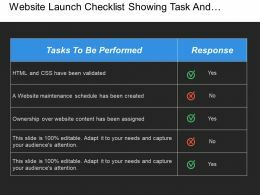 Presenting this set of slides with name - Website Launch Checklist Showing Task And Response. This is a two stage process. 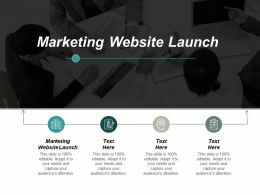 The stages in this process are Website Launch, Market A Website, Website Introduction. 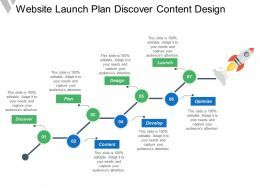 Presenting this set of slides with name - Website Launch Plan Discover Content Design. This is a seven stage process. 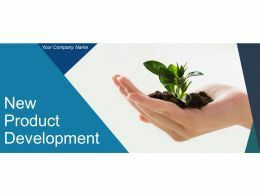 The stages in this process are Website Launch, Market A Website, Website Introduction. 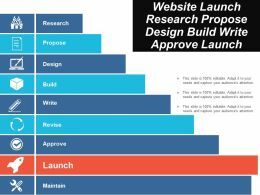 Presenting this set of slides with name - Website Launch Research Propose Design Build Write Approve Launch. This is a nine stage process. 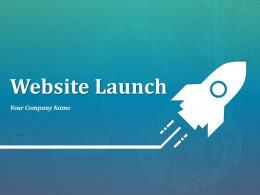 The stages in this process are Website Launch, Market A Website, Website Introduction. 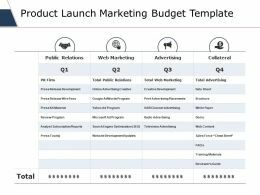 Presenting this set of slides with name - Product Launch Marketing Budget Template Ppt Outline. This is a four stage process. The stages in this process are Public Relations, Web Marketing, Advertising, Collateral. 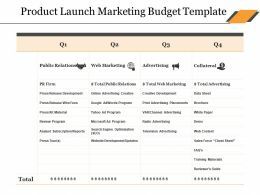 Presenting this set of slides with name - Product Launch Marketing Budget Template Ppt Ideas. This is a four stage process. The stages in this process are Public Relations, Web Marketing, Advertising, Collateral. 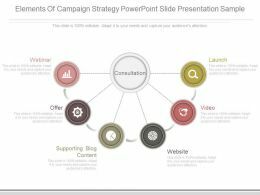 Presenting ecommerce marketing tips powerpoint templates. 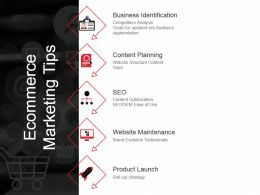 This is a ecommerce marketing tips powerpoint templates. This is a five stage process. 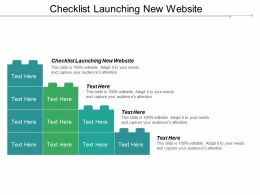 The stages in this process are business identification, content planning, seo, website maintenance, product launch, ecommerce marketing tips. Presenting elements of campaign strategy powerpoint slide presentation sample. This is a elements of campaign strategy powerpoint slide presentation sample. This is a six stage process. 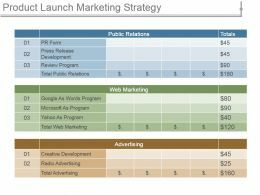 The stages in this process are consultation, launch, video, website, supporting blog content, offer, webinar. 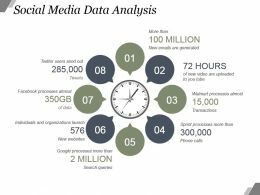 …is a social media data analysis powerpoint slide influencers. This is a eight stage process. 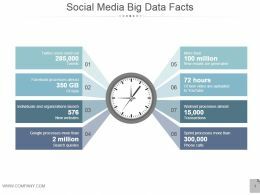 The stages in this process are facebook processes almost, individuals and organizations launch, new websites, google processes more than, search queries, twitter users send out, new emails are generated. …apt offline marketing example of ppt presentation. This is a offline marketing example of ppt presentation. This is a four stage process. 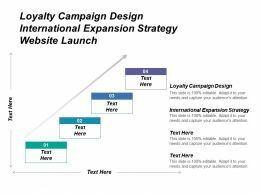 The stages in this process are big strategy, test with consumers, campaign website ads etc, new big strategy, focus groups, big launch, adjust, measure. 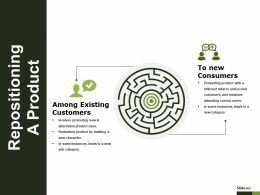 Presenting repositioning a product powerpoint slide presentation examples. This is a repositioning a product powerpoint slide presentation examples. This is a two stage process. The stages in this process are among existing customers, to new consumers, business, icons. …This is a offline marketing ppt sample presentations. This is a six stage process. 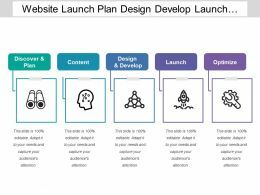 The stages in this process are big strategy, test with consumers, adjust, campaign website ads etc, measure, new big strategy, conventional marketing, big ideas, big bang launch, big budgets, focus groups, big launch. Presenting this set of slides with name - Template 1 Presentation Powerpoint. This is a five stage process. 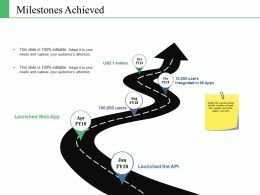 The stages in this process are Launched The Api, Launched Web App, Integrated In, Users, Million. Presenting this set of slides with name - Template 2 Presentation Diagrams. This is a six stage process. 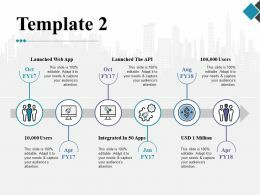 The stages in this process are Launched The Api, Launched Web App, Integrated In, Users, Million. 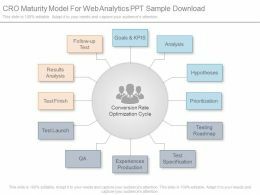 …cro maturity model for web analytics ppt sample download. This is a twelve stage process. 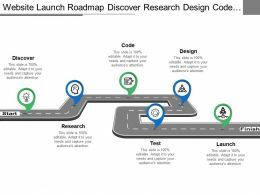 The stages in this process are goals and kpis, analysis, hypotheses, prioritization, testing roadmap, test specification, experiences production, qa, test launch, test finish, results analysis, follow up test. Presenting cro maturity model for web analytics ppt powerpoint guide. 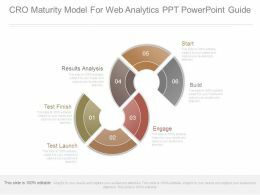 This is a cro maturity model for web analytics ppt powerpoint guide. This is a six stage process. The stages in this process are test launch, test finish, results analysis, engage, build, start.